Session 4, 7/29, Scalloway week - Old McDonald's Farm, Inc.
Get out of the city and grow, learn and thrive at our educational Farm Program for children. Enjoy one of six weeks of The Summer Program with hands-on, educational activities with chickens, geese, goats, rabbits, pig, cow, horses and ponies, and cats and dogs too! Learn the care and maintenance of each of the farm animals and get active with gardening, game time and learn to ride a horse. Academics are important; the entire program is taught by an experienced, Oregon State Certified Teacher. Please bring a sack lunch. 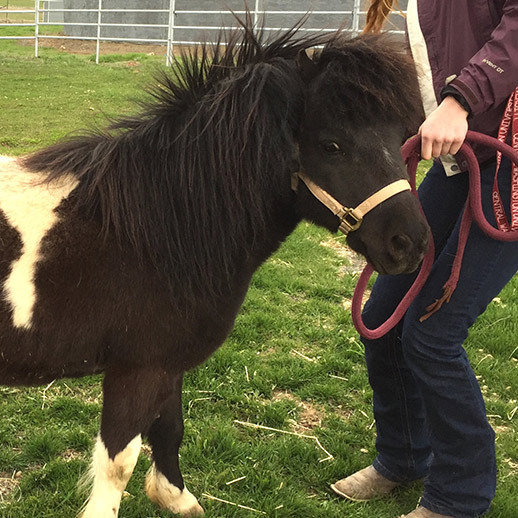 Each Summer Program is similar but this week we will focus on one of our American Miniature Horses, Scalloway. This breed originated in the Shetland Islands and then Argentina. They were used as “pit ponies” originally for hauling carts while mining coal, iron, etc. The Summer Program and Jr. Vet. Program Week presentations for the parents are on Fridays from 2:00 sharp to 3:30. Please bring something to share. Finger food is best but whatever you want to share is fine by us. OMF is not coordinating the food. The cost of the Summer Program is $239 per student. The cost of the Jr. Vet. Week is $249.